It is one of the most popular models in India; regularly sitting in the top ten, in fact top five best sellers every month, since its debut in September 2013. The made-in-India Hyundai Grand i10 has now sold nearly 6 lakh units that includes exports of 1 lakh 62 units since then. 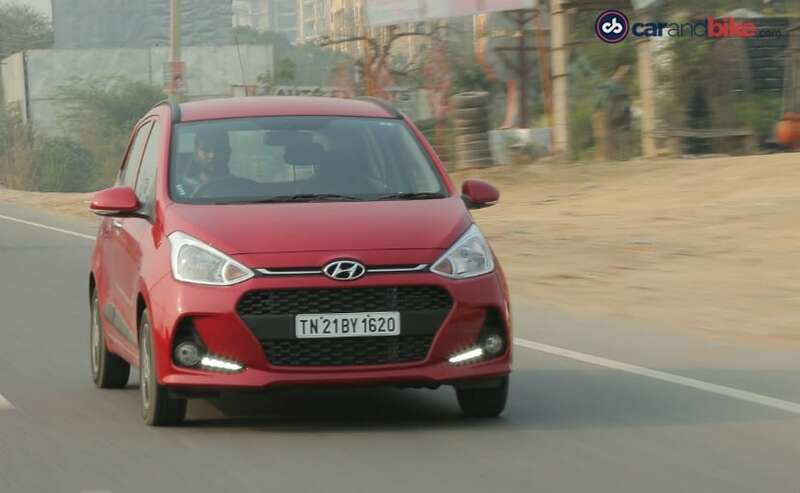 Hyundai has now launched the facelifted Grand i10, and we have already had an exclusive on its full review. At the time I had said clearly that at first glance you'll be forgiven for thinking this is the same old Grand i10. That's because it doesn't scream facelift. The new 'cascade' front grille and new signature LED daytime running lights are the only giveaway. Having said that the bumper design is tweaked front and back, and the cabin gets a new colour palette, and better connectivity options at the top end. 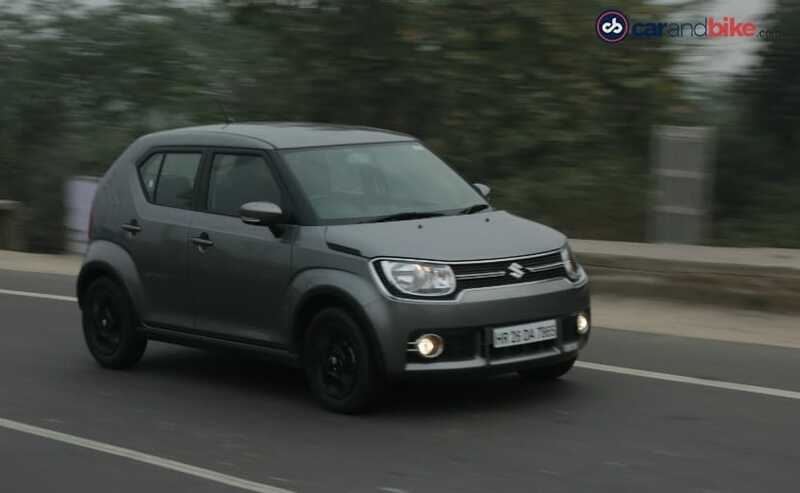 While the car is pitted directly against cars like the Maruti Suzuki Swift, Toyota Etios Liva and now the Tata Tiago, there is one more car it has to now deal with - the most modern and contemporary entry hatchback in the country - the brand new Maruti Suzuki Ignis. The Ignis has arrived with much fanfare, and in its one month since launch has already notched up 15,000 bookings. It is the only tall boy in this space besides the Wagon R that sits lower in positioning terms. Now on exterior design, when it comes to these two cars, it really depends on what you like more or what appeals to your sensibility. 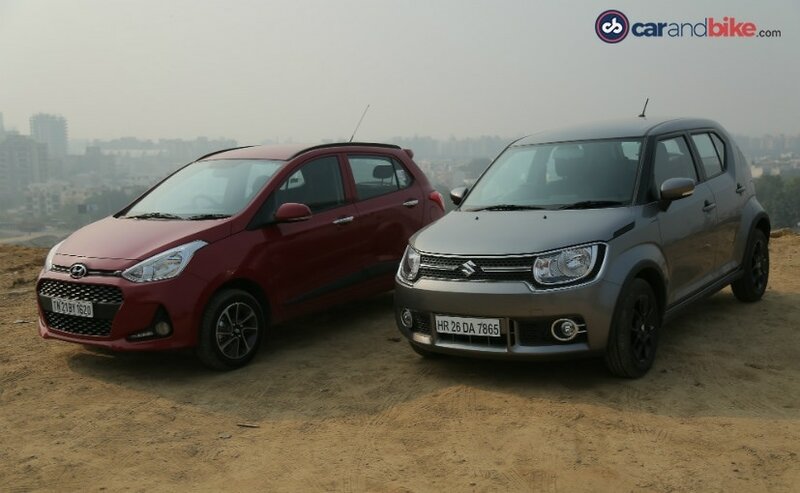 The Ignis is the quirky, modern, funky standout design, while the Grand i10's is the more staid, safe design. What's good about the distinction is the Ignis tells you instantly it's a tallboy - which means its got lots of headroom, and is easy to get in and get out of. 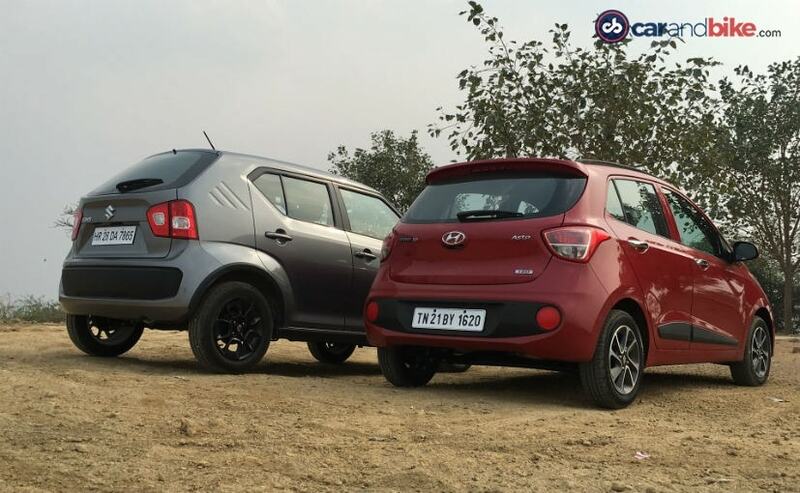 The Grand i10 looks bigger visually, and it does have the roomier cabin as well. So they are indeed quite different at the very outset. Both come in diesel and petrol - the Ignis has the 1.3 litre diesel DDiS that comes with manual and AMT options, and it's got a generous 190 Nm of peak torque. The petrol is the VVT with 82 bhp on tap. It also has both manual and AMT gearbox options. 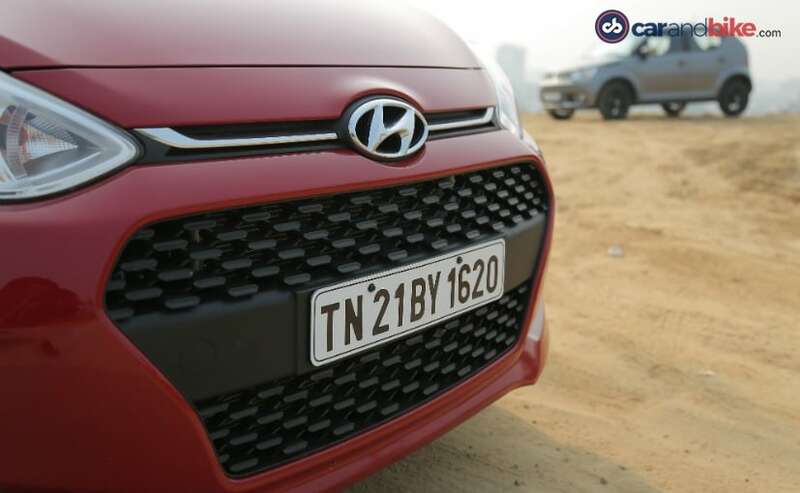 The Hyundai Grand i10 retains its efficient 1.2 litre Kappa dual VTVT petrol engine, and along with the 5-Speed manual, you also have a 4-Speed auto option. While mechanically the new Grand i10 remains the same, on the diesel side you get a slightly bigger engine. An extra 100 cubic centimetres gives you small bump up in power to 74 bhp, but a significant 30 Nm more in torque to match the Ignis DDiS' 190 Nm. And you really can feel that instantly when you begin driving it. The one chink in the Grand i10's armour had been that the diesel was considered lacking in punch. That has now been addressed for the most part. The car also remains the handling benchmark in this segment, and retains everything that was great about its ride quality too. 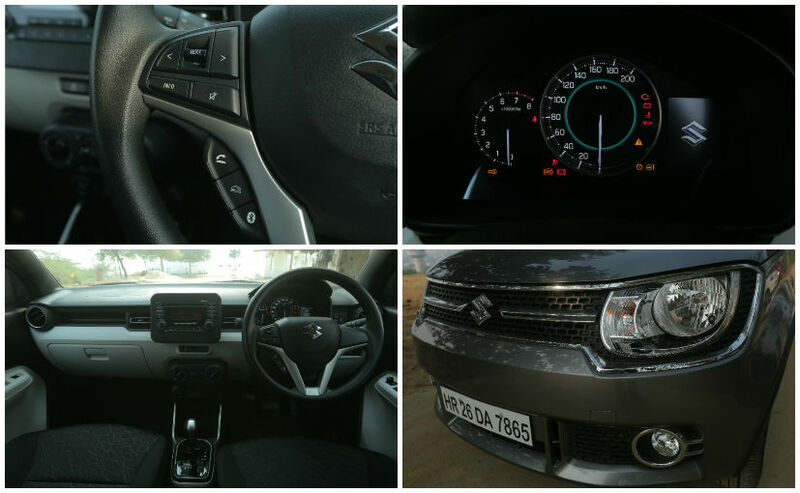 The Ignis has surprised me with its suspension as I said when I reviewed it in and around Chennai a few weeks back. The car's ride quality is just superb and while it does not have the suppleness of the Grand i10's ride, it has a refreshingly sporty stiffness you don't find in most other India market hatchbacks. The AMT also works very well on both fuel types, and that is quite a score for the Ignis. Maruti has been smart about offering the auto option with petrol and diesel. Both engines are zippy and efficient too. 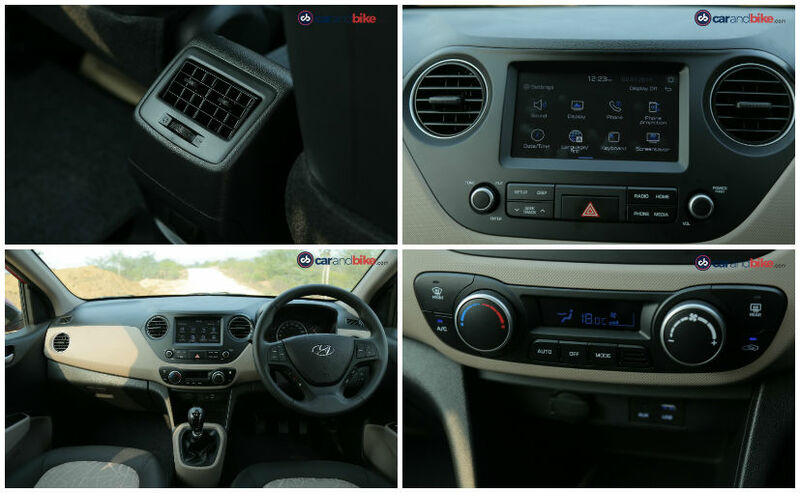 The updated cabin of the Grand i10 is still a familiar layout, with its two-tone beige and black look. On the top end Asta variant you now get a 7-inch touchscreen with Bluetooth connectivity. It also has Mirror Link, Apple CarPlay and Android Auto, which is great. The only downside is that it's only on the Asta. The base Era and Magna variants get no infotainment or music system, let alone connectivity. The engine start-stop button is also still only on the Asta. The steering mounted controls no include a voice recognition button to activate your connected smartphone's voice response feature. All of this makes the Grand i10 a little bit more contemporary, while staying as comfortable and roomy as it always was. The Ignis' cabin won't seem as roomy as the Grand i10's but has a sense of airiness thanks to the higher roof. The front seats are better contoured and more comfortable - a smart way to create a sporty seat by still keeping costs low. Getting in and out is also easier in this car. The big touchscreen on the top end Alpha variant has Apple CarPlay and Android Auto too. But it's a pity that Maruti will not offer this trim or this feature with the AMT gearbox. So if you want to go auto you have to relinquish the fancy features! It's the same with the Grand i10's petrol automatic. So many of you write in saying that you'd like the auto with the top trim, that I find it surprising manufacturers aren't getting this feedback too! 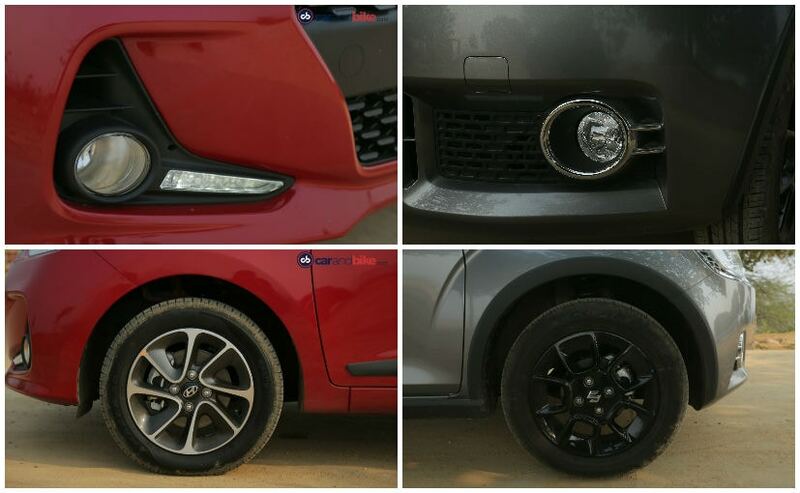 That also applies to the really cool daytime running lights on the Ignis and also the Grand i10. That's a pity really, as it sets up a great identifying factor for the car, which the majority of them on the road will just never have. But the good news is that both cars do well on safety. The Grand i10 offers a driver-side airbag as standard in the two base trims, and dual airbags from there up. But the Ignis does way better, since it has dual-airbags and antilock brakes (ABS) as standard. The prices show that the Grand i10 has seen a minor price cut, and so is quite attractively priced. The Ignis has fewer yet better loaded variants, and so is also good value. Here are the variant-wise ex-showroom, Delhi prices for both the cars. This segment is highly competitive, since there are so many products that you can choose from. And most of them are capable, efficient and offer good value. The Grand i10 has been a segment benchmark for some years now, and bests most rivals like the current Swift, the recently updated Etios Liva, and even the Tiago. But when it comes to this one-on-one comparison between the two cars I've got here, the Ignis wins hand down. It is the more contemporary, better-packaged, modern product - that also performs well. I will have to say that the Grand i10 is the better choice if you are looking for a family car that's roomy. But overall, the Ignis stays ahead. I can't wait to see how the next generation Swift does against them both, when it gets here in the summer.